The winds are one of the factors that play a crucial role in shaping the climate, but also in everyday life, in travelling and of course in leisure and holidays. The direction of a wind is associated with many factors and it depends on general and local causes. The general causes are due to two high barometric pressures that are generated one in Siberia and the other in the Atlantic Ocean, in the Azores and in its declining in the Mediterranean Sea. The local causes are due to the morphology of the terrain and the separation of the land and sea. The variety of the terrain-mountains, valleys, plains and mountains again, as the incessant rotating of land and sea is what makes Greece a place particularly affected by the winds. The winter from the center of the high barometric pressures of Siberia, southwesterly winds starts -the Russian "buran", arriving in Greece as very cold northeast winds that brings snow. Winds from the other center of the Azores, are directed towards North Africa. There, they are heated and then as they are turning to Greece they absorb water vapor from the Mediterranean Sea and arrive southly, bringing rain. Depending on what center prevails each time, sometimes it rains and sometimes it's sunny. But the variations of the ground and the alternation of land and sea have as a result many differences in the directions of the winds in Greece from region to region, even when they aren't far away from each other. Near the coast the wind changes direction, depending on the formation of the bays and the mountains. In the mainland the wind often takes the direction of the valleys. So when we are travelling in continental Greece it is most likely that we won't meet any stable winds. Each place - basin, plateau or coast - has its own local conditions. A cold wind in one place can be hot in another place. Generally in winter, spring and autumn the winds in the Eastern Mediterranean are complex and unsettled. The barometric depressions of the Mediterranean becomes the reason why the winds are changing frequently and irregularly, but some winds are distinctive and somehow regular. Such a wind is the Sirocco or Sorocos in Greek. Sirocco blows in Greece as a south or southwestern wind and its muggy. It mainly blows from November till May and sometimes brings with it sand from Africa. Many times if it is required to pass by mountains and becomes downward, reaching an area, it becomes much hotter, as very hot and dry wind and takes on the characteristics of the known in Northern and Central Greece, wind Fen. Typical are also the north and northeast winds, downloaded from the center of the Siberian high-pressure. They are powerful winds bringing strong cold and snow. They are named "ornithae" by the ancient Greeks. Other winds that blow frequently in the spring have been named by the ancient Greeks "Lefkotonoi". And that is because they bring fine weather unlike the cloudy winds of winter. In summer the temperature is changing but it also changes the wind conditions. 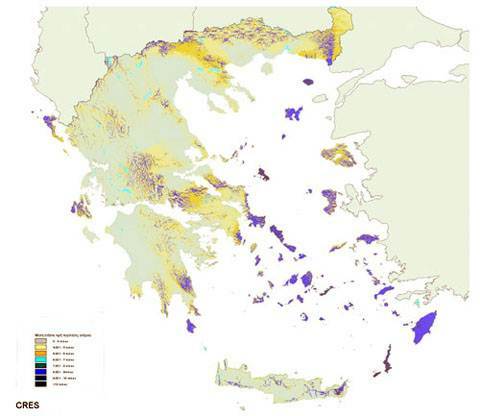 The barometric depressions in the Mediterranean are absent and the winds become regular in Greece. Stable north winds are blowing and when they stop within the Greek mainland, no wind prevails, resulting this way very hot temperatures. In the contrary to the coast and islands when north winds aren't blowing a soft breeze is blowing. During the day ,the sea breeze and at night the afternoon breeze. Each one makes the summer heat more gentle and tolerable.